Hear the phrase “solid gold watch” and you might imagine the sort of thing A$AP Ferg or Floyd Mayweather would wear before a performance. But F.P. Journe has debuted an alternative to such outré bling – it’s gold, yes, but just about as understated as it comes for a $50,000 timepiece. 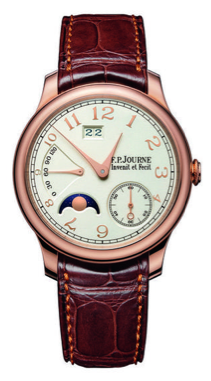 Actually, Journe is making three alternatives: the Chronomètre Souverain, Octa Réserve and Octa Lune models. Each has a solid gold movement inside and a fully gold dial. This is significant because while Journe has long been the only watch brand to make all of its movements in 18K rose gold, it hasn’t before offered a gold dial as well. In fact, Journe watchmakers used a new method to sand and layer the faces of the watches, and then they polished their trademark drop-shaped hands until they shone like mirrors. The resulting 40mm (or, for a smaller option, 38mm) dials have hour- and minute-indicators and a power reserve indicator on the face. Just 38 turns will wind them completely, for a total 56 hours straight running time. And each comes exclusive with the patented F.P. Journe Caliber 1304 movement. Pricing starts at $30,580 for the Souverain and exceeds $53,000 for the Octa Lune. Call them the discreet option to Shabba’s eight gold rings.